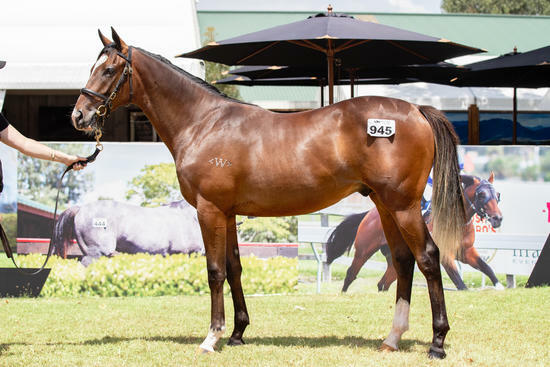 Some great opportunities can emerge from anywhere with Ellerton Zahra Racing offering a chance to get involved in the ownership of this colt from one of New Zealand’s best families at an entry-level price. This colt is a son of REDWOOD, an outstanding racetrack performer by HIGH CHAPARRAL, who was a Group 1 winner in Canada and competitive in top races all around the world, running second in Group 1 races in Hong Kong and Dubai. REDWOOD has done a solid job at stud in New Zealand producing the promising Group 3 winner NIGHT’S WATCH as well as the New Zealand Derby runner-up RISING RED and stakes ROMANCER from limited opportunities. The female line of this colt’s pedigree is simply unbelievable with his dam SURPRIZE SURPRIZE a Group 1 winner in NZ while she has produced three winners of her own with her progeny showing they’re tremendously adaptable, winning races in NZ, Hong Kong and NSW. SURPRIZE SURPRIZE’S sister UPRIZE was Group 2-placed while the colt hails from the same family as the brilliant New Zealand Derby winner ZONDA and the Group 2 winner and Melbourne Cup placegetter MAGNOLIA HALL. This colt has that mix of staying power and a miler’s speed in his pedigree so don't miss the opportunity to be involved in this super young athlete. REDWOOD (GB) (Bay or Brown 2006-Stud 2012). 4 wins-1 at 2-from 1m to 1½m, Woodbine Northern Dancer Turf S., Gr.1. Sire of 103 rnrs, 56 wnrs, inc. SW Night's Watch (MRC Naturalism S., Gr.3), Rising Red, Romancer, SP Platinum Invador, Sword in Stone, Livin' on a Prayer, Rosewood, Swampland, The Heiress, High Mode and of Rock on Wood, Te Quiera, Big Sur, Chamalu, High Sierra, I See Red, Red Sierra, Suliman, Tamarack, Woodloveto, Chief Sequoyah, etc. Prosperity (g. by Zabeel). 2 wins at 1600m, 1800m, HKJC Lambeth H., Cheung Cup, 2d HKJC Kowloon West H., 3d HKJC Tsam Chuk Wan H.
Future Shock (g. by Redoute's Choice). 2 wins at 1100m, 1400m, 2d ATC Central Coast Holden H., Ladies in Racing Magazine H.
Toitoi (f. by Iffraaj). Winner at 1200m in 2017-18, 2d BOP RC J Hyde-Hills at Crockfords H., 3d Waikato RC Foster Maintain H., Counties RC Fasttrack Insurance 2YO S.
Adrien (g. by Street Sense). Placed, 2d Singapore TC Initiation P., 3d Singapore TC Initiation P.
SURPRIZE SURPRIZE (Prized). 8 wins. See above. UPRIZE (Prized). 5 wins from 1200m to 1600m, NZ$38,150, A$184,500, VRC Matron S., L, CJC Inglewood S., L, 2d AJC Emancipation S., Gr.2, MRC Mannerism S., Gr.3, CJC Warstep S., L, 3d MRC Coongy H., Gr.3. Haze. 2 wins at 1400m, 1600m, Waikato RC Te Akau Racing Stables H., 2d Counties RC Hyster Forklifts H. Producer. Perfect Parma - Wonderful Moments (H.K.). 4 wins at 1400m, 1600m, A$13,475, HK$3,537,500 in Aust. and HK, HKJC Sha Tin Mile Trophy H., HKU Faculty of Arts H., Kwong Fuk H., 2d HKJC Kennedy H., Kowloon Cricket Club Centenary Cup, 3d HKJC Lion City H., Tan Shan River H.
Impulsive Reality. 2 wins-1 at 2-at 1350m, 1650m, SAJC Thoroughbred Express 2YO H., 2d SAJC Monde Bleu at Bullarook H., 3d SAJC Marsh 2YO H., Signs Incorporated H.
ZONDA (Zabeel). Champion Older Male Miler/Intermediate in NZ in 2001-02. Joint Head of The 1997-98 NZ 3YO Free H. 7 wins from 1600m to 2400m, NZ$391,500, A$583,000, ARC The Oaks Stud Classic, Gr.1, New Zealand Derby, Gr.1, MVRC Alister Clark S., Gr.2, Avondale Guineas, Gr.2, ARC King's P., Gr.3, Counties RC Bluebird Foods Championship H., 2d VRC Australian Guineas, Gr.1, 3d VATC Autumn Classic, Gr.2, WRC Dixon & Dunlop Ltd H., Lion Brown H.
MAGNOLIA HALL (Noble Bijou). 6 wins from 1600m to 2600m, A$473,420, QTC PJ O'Shea S., Gr.2, AJC Summer Cup, Gr.3, St Marys Theatre H., 2d AJC Colin Stephen H., Gr.3, Meapro H., PH Osborne Welter H., STC Warrawee H., 3d VRC Melbourne Cup, Gr.1, AJC Metropolitan H., Gr.1, GCTC Prime Minister's Cup, Gr.2, AJC Chairman's H., Gr.3, 4th STC Hill S., Gr.2. MAN OF HONOUR V (Noble Bijou). 9 wins from 1700m to 2400m in Malaysia, Singapore TC Queen Elizabeth II Cup, L, Singapore Derby, L, 2d Penang TC Yang di Pertua Negeri Gold Cup, L, 3d Singapore Gold Cup, L.
Tiggy Touchwood (Touching Wood). 3 wins from 1600m to 2000m, STC Cronulla RSL 55 & Over H., Pioneer International H., 2d AJC Australia Day Cup, L, Liverpool Catholic Club H., STC Cameo Club H., 3d AJC Bondi Junction H. Producer. SCARLET VANHARA (Van Nistelrooy). 2 wins at 1400m, 1600m, CJC Inglewood S., L, 2d ARC Telecom H., Waikato RC Classic Hits 98.6ZHFM H., 3d Counties RC Auckland Thoroughbred Breeders' S., Gr.2, BOP RC Hills Haden Valuers 3YO H. Producer. MORVADA (Mossman). 4 wins-1 at 2-from 1400m to 1600m, A$248,580, to 2018-19, SAJC Oaklands P., L, 2d Moonee Valley Vase, Gr.2, 3d SAJC Chairman's S., Gr.3, Sires' Produce S, Gr.3. Win Practitioner (O'Reilly). 6 wins-1 at 2-from 1200m to 2200m, HK$6,574,000, HKJC Ping Shan H., Li Yuen H., 3d HKJC Citi Champions & Chater Cup, L, Queen Mother Memorial Cup, L.
Palette Natural (Volksraad). 4 wins from 1400m to 1800m, HK$7,439,500, HKJC Dublin H., 2d HKJC Chairman's Trophy, L, 3d HKJC Stewards' Cup, L, Queen's Silver Jubilee Cup, L.
DIXIE BLOSSOMS (Street Sense). 6 wins from 1250m to 1600m, A$1,012,910, to 2017-18, ATC Guy Walter S., Gr.2-twice, Angst S., Gr.3-twice, 2d ATC Golden Pendant, Gr.2-twice, Guy Walter S., Gr.2, Toy Show H., Gr.3, Illawarra TC Arrowfield Classic, Gr.3, 3d ATC Queen of the Turf S., Gr.1, VRC Myer Classic, Gr.1, ATC Emancipation S., Gr.2-twice, NSW Tatt's RC Tramway S., Gr.2. ABLE GREEN - EXCEL (Mac.) (Falbrav). 5 wins-1 at 2-to 1500m in Aust. and Macau, Macau 4YO Prelude, L.
WOLFENDALE (Astronomer Royal). 3 wins from 1600m to 2100m, A$128,640, in 2017-18, TRC Hobart Guineas, L, 2d Tasmanian Derby, L.